Since the video came out on YouTube last week, Rhian Ramos has been silent. No word from her on the issue that must have rattled her to the core, whether what Mo Twister revealed was true or not. Finally, we get to finally hear her side. 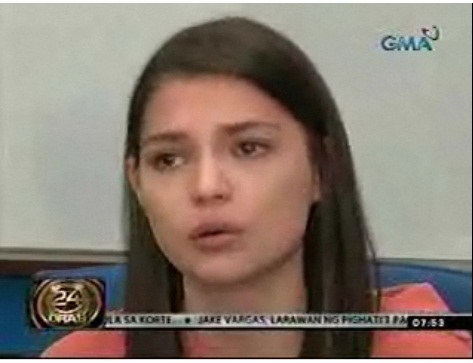 Rhian Ramos made a statement on ’24 Oras’. Rhian Ramos was with her lawyer, Atty. 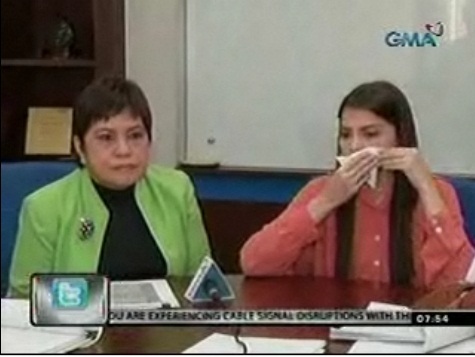 Lorna Kapunan, and her mother Clara, when GMA News interviewed her. No official statement was issued yet regarding the abortion allegation by Mo Twister although Rhian addressed the issue indirectly, tearfully and briefly. “I think more than what the people have seen, I’ve been hurt over a longer period of time unnecessarily and I think undeserved. " "I just hope to be able to put an end to that so that hopefully I could move on,”- Rhian Ramos very short statement. Rhian Ramos was cut short by her lawyer Atty. Lorna Kapunan. Saying that she hopes everybody would move on and even the media should move on. They will file a case against Mo because he violated Republic Act 9262 or Anti-Violence Act Against Women and Their Children Act of 2004. Rhian Ramos will seek temporary protective order against Mo Twister according to her lawyer. Rhian Ramos to file criminal case against Mo Twister! Rhian’s appeal for a temporary protection order will legally shield her from Mo’s alleged harassment. The complaint will also be based on Republic Act 9262 of 2004 or the Anti-Violence Against Women and Their Children Act. The lawyer said that the protection order was not about distinguishing the truth from lies, but putting a stop to the harassment. Rhian Ramos mom and her whole family is supporting her all the way! Meanwhile Rhian’s mother Clara Ramos revealed that despite the devastating controversy, Rhian is “okay and functioning properly.” She thanked Rhian’s supporters for giving her strength. “We really appreciate you guys, all the fans, supporters of Rhian, nakakataba ng puso na nandiyan kayo to be at her side, and giving her love. Thank you so much,” Clara said. Rhian’s Mom also shared the irritation they’re feeling due to the abortion allegations. “Siyempre, malungkot siya ano? Talagang it’s devastating. I’m glad that she’s able to be okay and function properly naman,” sabi niya. Nagpahayag din si Mrs. Ramos ng matinding inis sa mga pahayag na isa sa dahilan ng umano’y abortion ni Rhian ay ang pressure ng kanyang pamilya. Rhia Ramos signed the complaint affidavit that will be filed by her lawyer to the proper court allegedly tomorrow DECEMBER 6, 2011. Natatawa ako sa iba na nag papahayag na naka file na as in past tense na, Press Conference lang po yun kanina hindi naman korte ang mga reporters. RHIAN RAMOS WAS CUT SHORT BY HER LAWYER WHEN SHE BREAKS DOWN AND CRIED DURING THE PRESS CONFERENCE. Rhian did not deny her alleged abortion but then again, I don’t think people would believe her anyway if she did. Rhian Ramos declined to answer questions on the issue from the media. But her lawyer said that will be done in due time. An official statement will come out very soon. Their priority at the moment is to file a case against Mo twister, Mohan Gumatay in real life. According to Atty. Kapunan, Mo Twister violated Republic Act 9262, or Anti-Violence Against Women and Their Children Act of 2004. She did not elaborate. Kapunan also revealed that Rhian Ramos will file for a protection order against Mo Twister to try to stop him from further issuing damaging statements to the public. Their evidence? The statements Mo has already released since the scandal broke out, and probably even the ones before that – the tweets about abortion that he started posting two weeks back. “The court will determine if it will issue a permanent protection order,” said Rhian’s lawyer. Rhian Ramos' lawyer Atty. Lorna Kapunan claimed that the said protection order that they will ask from the Muntinlupa Regional Trial Court tomorrow, Tuesday, December 6, 2011. Normally it will still go through the fiscal office. GMA Network, where Rhian is a contract artist, has also indicated that it will file a separate case against the radio DJ-TV host for malicious and false imputations against the network in his video posted last Friday afternoon on YouTube. Interesting fact : Rhian’s mom is annoyed that their family is being put in a bad light because they’ve supposedly pressured Rhian to get an abortion, again, no denial on the abortion.